Stardust is a Neil Gaiman creation that has existed in so many forms that I have lost track of all of them. We know there's the orginal book but there's also at least one graphic novel adaptation and of course there's also the live-action movie. 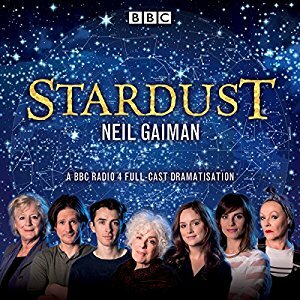 But given the continued longevity of BBC Radio when it comes to bringing various works of fiction to life, we now have yet another version of the Stardust story to enjoy. This is more than just an audiobook - in fact it's a full-cast dramatisation of the work with a very diverse set of voice talents helping to bring the story to life. This was originally released on BBC Radio 4 but was later distributed as an audiobook, which is how I came around to listening to it, finally. Synopsis: Stardust began as a novel written by Neil Gaiman with illustrations by Charles Vess. In 2016 BBC Radio 4 released a full cast dramatisation divided into two parts. This review reflects the Audible Audio distribution of the work. As narrated by Elanor Brown, our story focuses on the unusual circumstances that led to the birth of Tristan (Matthew Beard) who grows up to be a curious enough young man who decides he's willing to do anything for the heart of Victoria (Aisling Loftus). And this includes willing to cross into the land of Faerie to seek out the fallen star in order to win her hand. At the same time, the eighty-first Lord of Stormhold (Michael Roberts) passes, leaving his sons to settle the matter of succession. However he had left them a final challege - to find the Power of Stormhold, which he had cast out the window towards the sky and was actually reason a star had fallen while Tristan was trying to woo Victoria. Thus his remaining sons Primus (Finlay Robertson), Tertius (Alex Macqueen) and Septimus (Blake Ritson) must now venture to find it before they find themselves murdered under mysterious circumstances. And then there's the three witches known as The Lilim, the eldest being Morwanneg (Frances Barber), who need the heart of the fallen start to restore their youth and stay alive. TL;DR: Stardust as a BBC Radio 4 production is an amazing experience in itself and does present itself as one of the better ways to experience this story beyond the original graphic novels and such. It's very well-acted and produced, making for a rich listening experience. And thus it totally deserves 5 beautiful glass sculptures out of a possible 5.